DeKalb County State Court is well-known to our top DeKalb County criminal lawyers, who have helped thousands of defendants in this Georgia court over four decades. 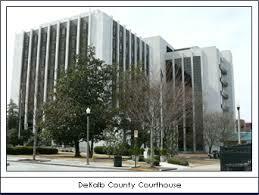 The State Court of DeKalb County location is 556 N. McDonough Street, Decatur GA 30030. The phone number is (404) 371-2261. A good DeKalb County DUI attorney with years of trial experience will never tell you to plead guilty at your first court appearance. More than 90% of GA DUI case verdicts never get decided by a 6-person jury, or by a judge during a bench trial. This is because over 90% of drunk driving defendants decide to plead guilty to all traffic offenses at the arraignment, or hire an attorney that does not want to bring cases to trial because of inexperience. We appear in State Court of DeKalb County every week, fully prepared to fight the State’s evidence at every turn for our relieved clients. Georgia DUI cases, even misdemeanor ones, can go on for up to 2 years before you are found not guilty or guilty. The best criminal defense lawyers know full well that patience and waiting are advantageous to the defense. The court calendar stays booked year-round, and court dates get moved around all the time. Your attorney’s legal staff will keep you posted about all upcoming DeKalb court dates, even if you don’t have to attend in person. Per Georgia law, the only court date you have to be present for is the last one where you enter a final plea. Our criminal attorneys will appear before the judge in your place, and will let you know what happened and what to do next. The elected Solicitor General of DeKalb County State Court is Sherry Boston. Ms. Boston was appointed Solicitor-General by Governor Sonny Perdue in 2011 and was elected without opposition in 2012. After your drunk driving arrest by DeKalb County Police, your case will be reviewed by an Assistant Solicitor-General (ASG) in Ms. Boston’s office. If the ASG decides to prosecute your case, you will be arraigned. Almost every drunk driving case gets prosecuted. If you plead guilty at your arraignment, you will be sentenced by the presiding Judge. If you plead not guilty, your case will continue through pre-trial motions hearings and calendar calls. If your case goes to trial, a 6-member jury will hear your case and decide your guilt or innocence. Under Georgia laws, the larger population counties can set up “State Court” to handle misdemeanor DUI and other misdemeanor crimes like misdemeanor drug possession of less than an ounce of marijuana, as well as traffic offenses. DeKalb County State Court has jury trial authority. In Georgia, misdemeanor impaired driving trials consist of six (6) jurors instead of 12. Twelve jurors are impaneled for felony criminal cases. DeKalb County State Court has jurisdiction over arrests made in the unincorporated areas of the County. If you were arrested within the city limits of Doraville, Decatur, Avondale Estates, Stone Mountain, Chamblee, Lithonia, your DUI arraignment will occur in each city’s municipal court if the charges are misdemeanors. For a felony DUI, or if you elect to have a jury trial, your case will be moved to State Court.